I saw The Perks of Being a Wallflower a few weeks ago. It made me miss high school (which, for me, is a big deal). Universally, I do not miss high school. Even sepia toned and romanticized, it was a place where establishment kept us until they figured we may as well go out and be useful. It was a holding pattern. It was confusing and full of pettiness. It was people trying to be everyone else and caring too much about what other people thought. It was trends and crappy music and so many hormones. High school was not my scene. No. I was excited about being ‘grown up’. I wanted college. I wanted to make my own rules. I never had any great self-destructive plans, or great rebellious end game, but I wanted to have it as an option. I wanted to pick out my own dishes from Target. I wanted my chance to change the world. I am happy to leave high school in the past. You can ask my husband. I am not shy about my lack of affection for ages 15-18, but when I watched that movie it reminded me of something. 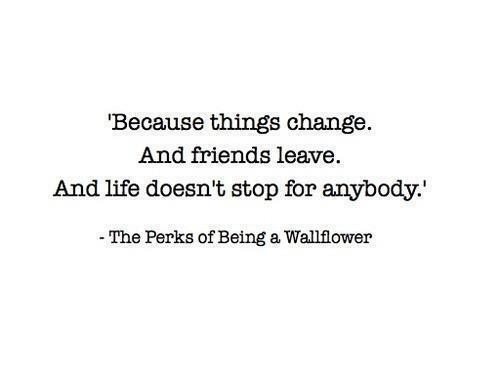 Perks of Being a Wallflower captures so many wonderful shades of emotion. It brought up memories of how raw everything felt at sixteen. Life was its own magnifying glass. Embarrassment was mortification, fear was paralysis, happiness was ecstasy, hurt was terminal, hate was loathing, like was love, and everything bounced around inside of me, fighting for space, until I could not breathe. Next week was forever, tonight was a second, and every day was one more experience the world opened unto me. Six people were my core. I loved one of them differently than the others. I still do not know if he knew, but I like to think he did. After all, we knew everything about each other. Three in the morning conversations, hanging out in parking lots, and promises to be best friends forever were the norm. Near ten years later, though, things have shifted. Two of those people stood up with me at my wedding. Two of them I speak to on occasion through social media, but we are far from close. Two of them I have no contact with at all. This movie made me think about that and how that happened. How did we go from being joined at the hip to not even being friends on facebook? There are all the normal excuses. We are different than we were back then. We have different interests, different priorities, different cities in our addresses. That is true, but how did we let that happen? Did we let this happen? Does this keep happening? Do I trade in old friends or a new set every five to ten years like a car? Maybe. I guess I will have to wait and see. If I took one overall thing away from the film it is we were not put on this earth to walk it alone. Love is worth the risk. It is. This is not restricted to amorous love. I mean this in the broadest way. Friends, strangers, co-workers, enemies… everyone. Love well. Love more. Love often.